You’ve read the posts about how social media, email or letters are all the rage. But you’re flabbergasted at all the work to reach out to clients. How do you choose? What if you just have no idea? What if you’re introverted and scared? Trying to decide is horrible. Like going to the fridge at beer o’clock and deciding between the god-awful Guinness or the non-alcoholic wine your roommate left you as a joke. The truth? All of these things are good tools if you make them work for you. You just have to align the strength of the tactic with your own personality. So let’s make these decisions easier for you and how you can implement each outreach method the right way. Social media is a great place to reach out to people, but it works best when you are actually connected in some way to the people you are reaching out to. While you may find Facebook groups useful for one-time jobs and work (and there’s nothing wrong with that), it’s not always the best place to make lasting connections. For translators, LinkedIn is generally the better choice, as you can see who is connected to whom and whether you can leverage someone you know to introduce yourself. You can also connect with people simply because you work in their sector, although I personally don’t find this works as well unless you have a plan to constantly follow up with the person. Twitter is another beast, and is great for keeping up with a company’s news, which can be a lead in to network with them on LinkedIn. Any way you cut it, social media is not a place for selling. So you have to be prepared for the time it takes to establish relationships. Pro: You can reach out to pretty much any prospect you want. You can also find out so much information on social media in an instant that it used to take marketers months to research! Con: Just because you can reach out about your services doesn’t mean prospects want to be sold to. You have to be very patient and know how to be a social butterfly, or else people will reject your promotional approach. Is this tactic for you? Do you love sharing, answering questions, and being helpful? Can you deal with the drama of social media? Are you willing to put the time and effort into these platforms? Then social is for you. I think that email marketing is something that introverts dreamed up so that they don’t have to market to people in person! However, it is rare that you will “sell” your services to someone over email. Email marketing is a fine art. You don’t want to overwhelm people and be reported as a spammer, but you need to follow up enough to make sure you cut through the noise. 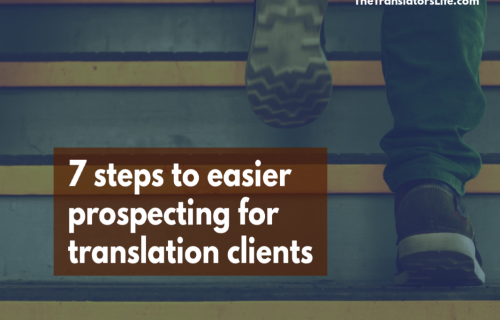 You’ll get tons of inbound translation requests by email, but you won’t sell over email if you’re the one initiating the contact. People need to get to know you and trust you, and it can take a long time to do this through your inbox. Pro: You can warm the waters to give people a sense of who you are. A well-crafted email can pique someone’s curiosity and get the ball rolling faster for you than a tactic like snail mail. An email introduction can also warm up a prospect for calling or writing a letter later on, so that these efforts don’t come out of the blue. Con: Unless your prospects are highly targeted, your response rate will generally be low. Only a small percentage of companies will be ready to hire you, and you may need to follow up quite a few times. Is this tactic for you? Do you have the patience to painstakingly look for email addresses? Do you like tracking responses? Do you have a stomach for rejection and the will to follow up over the phone or by mail? Then you can make a go of email. Who the heck writes letters anymore? Businesses that want clients do! Since email and social media are so seductive, letters (which are very unexpected from freelancers) can be a jolt to your prospect’s grey matter. Enough to wake them up that you are someone to be taken seriously. Like email, you won’t sell people from the letter alone, but you can introduce your services in a longer format than you can with email and social media. This lets you take the time to explain your accomplishments and why you are a great fit for your prospect. Pro: Introverted translators who love the written word and the distance of snail mail are pretty much made for letter-writing! Con: You must produce professional letters with no mistakes. You need to spend hours finding addresses. Is this tactic for you? Love doing your marketing in bulk? Then sending hundreds of letters at once just a few times a year can save you the headache of constantly hanging out on social media. Ah, the phone. That ancient contraption we would rather fling out the window into oncoming traffic than actually pick up to speak to a live human. Because, you know, what if that person actually responds? Gasp! I’m with you. I hate the phone. Not because I have a millennial passion for texting or Snapchat but because I have a Gen X love for good old-fashioned email. However, you shouldn’t discount the phone. 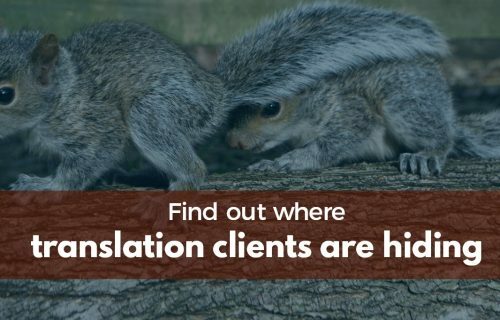 First, as with physical letters, very few of your fellow freelance translators are using this medium to reach out to clients. You’ll stand out. 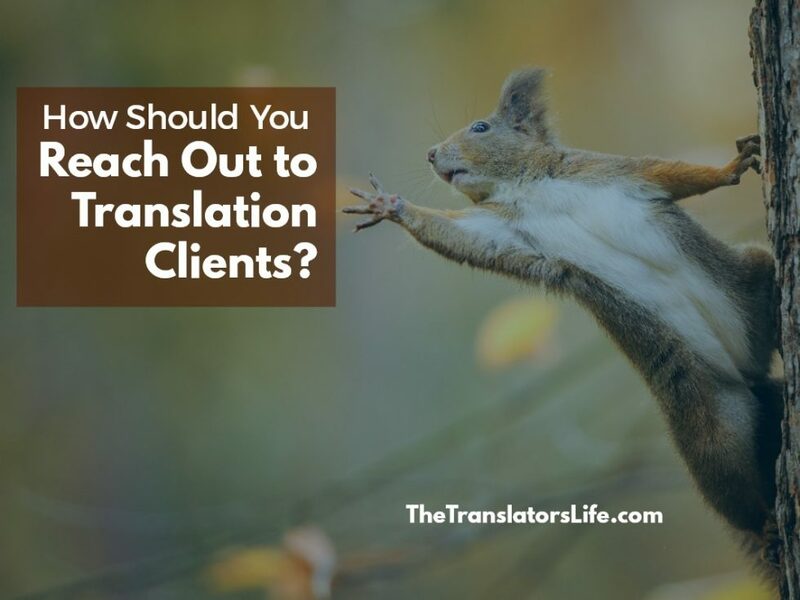 Second, you can find out in a two-minute conversation whether a company is interested in your translation services–something that could take you weeks with email to learn. Pro: If you commit to practising your spiel, the phone can lead to faster prospecting. Is this tactic for you? If you can get over yourself and realize that people can’t actually bite you through phone wires, then I recommend you give it the old college try. Turn on the Internet tube these days and you’ll see right away that even translators need to start a blog. Blogging will get you clients, they say! Or if it’s not blogging, then it’s an ebook. Or a lead magnet. Now, let’s hold on a second. Content marketing is great. I myself am a Copyblogger-Certified Content Marketer. And as such, I beg you: Don’t start a blog! At least, don’t start one about translation that your clients don’t care about. Creating content for client outreach takes strategy, research, and testing. And especially commitment. So if you haven’t spent time studying how blogs work and how content attracts prospects, you’ll waste time creating content that doesn’t work when you should just be hitting up your speed dial or hitting send. Pro: If you write a blog that is very industry specific or create an information site that your prospects will find useful, then you can use these as a way to reach out to clients. Con: You have to know what you’re doing! The Internet is riddled with blogs people have left for dead. That is a waste of your precious marketing time if you just want to add to the “me too” chorus of translators. Is this tactic for you? If you have a burning passion to write about your client’s industry and want to use your writing to boost your authority, then by all means, include this weapon in your outreach. But know what content marketing is for. Don’t expect clients to beat down your door just because you posted something on the Internet. These tips are meant to help you avoid starting a tactic just because you think you should. No matter what you hear, any way you want to find clients is a fine way, whether you call, email or tweet yourself silly. And no matter what the platform, what matters most is introducing yourself as the professional you are and creating a rapport with the person who buys translation services. 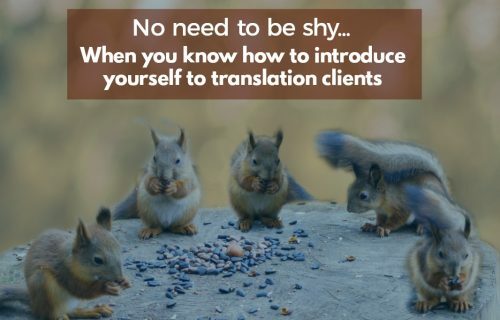 Because that, my dear translator friend, is what makes reaching out to prospects truly effective.